Nick Iadanza is a well-known and highly respected name in the world of mushrooming - especially in the Pacific Northwest - and many of his articles have been published on a wide variety of fungal subjects. 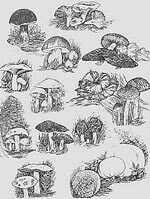 The following article appeared in the January 2015 issue of MushRumors, the excellent monthly publication of the Oregon Mycological Society, and we found it so interesting and informative that we asked for, and were given, permission to reprint it here. "Chanterelles are relatively high in vitamin C and potassium, and among the few foods that provide a significant source of vitamin D. Yellow-orange carotenoid pigments, also present in apricots and other plants, could explain why some fresh fruiting bodies smell like apricots (not to this author’s nose). Unlike other mushrooms, which grow rapidly and produce large flushes of spores over a week or two, chanterelles grow slowly (2–5 cm/month), persist for an average of 44 days, and produce a continuous supply of slowly maturing spores over a month or two. This reproductive strategy necessitates some means of discouraging insects and other animals from eating them before they discharge their spores. Resistance to insect infestation is well documented, at least in the Pacific Northwest and northern Europe. A study in Finland showed that less than 1 percent of chanterelles were damaged by insects, compared to 40 to 80 percent of other fungal taxa. Chanterelles in the midwestern and southeastern United States do not appear to have the same level of insect resistance. Metabolites extracted from chanterelles reveal high insecticidal activities, with similar potencies as some standard pesticides, as well as significant activities against bacteria, yeast, and molds. Significant amounts of ergocalciferol, or vitamin D2 (a rare form of vitamin D in nature), which regulates calcium transport in humans has also been isolated from chanterelles. Vitamin D2 is used in rodenticides because it causes accumulation of calcium (hypercalcemia) in mammals. However, it would be difficult to consume enough chanterelles to reach toxic vitamin D2 levels in humans. Also, in response to bruising or injury, chanterelle fruit bodies form hydroxylated fatty acids, such as as cibaric acid, and (8E)-10-hydroxydec-8-enoic acid. These fatty acids are heat labile, and destroyed during cooking. It is thought that the high amounts of vitamin D2 and these fatty acid derivatives may explain why insects, slugs, and other organisms rarely attack chanterelles. It’s unclear why this pest resistance does not extend to chanterelles in other parts of the country but it’s one more reason to count ourselves lucky to be living in the Pacific Northwest."